Is your knee pain holding you back from your cheese curds? Sara Shupe, MSPT, Dip. MDT is a physical therapist specialist and founder of J.O.Y. Physical Therapy Inc, a mobile and tele-health physical therapy provider servicing the Twin Cities Metro Area, greater Minnesota, and western Wisconsin. Sara has presented early access models of mechanical diagnosis and therapy (MDT) in the treatment of low back pain to the American Physical Therapy Association (APTA), National Association of Spine Society (NASS) and The international MDT Conference in FL, UT, CA and MN. If you read the title to this blog and asked, “what the heck is a ‘cheese curd?’” you are clearly not blessed to be born and raised in Minnesota or Wisconsin. 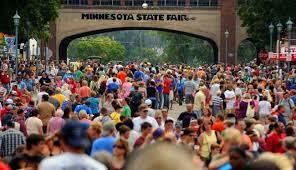 In these glorious states, we look forward all year to spending $10 on a greasy bowl of cheese pieces fried in vegetable oil at the great American get-together: The Minnesota State Fair! Our hearts and muscles are thankful that the days also consist of miles and miles of walking and standing in line for these great cholesterol concoctions. You’ve been looking forward to this all year and now that nagging knee pain is threatening your adventure! So you reluctantly, but prospectively, head to the doctor. You are given an “evidence based medicine.” This consists of a Xray, told that you have “arthritis,” written a prescription for the latest-marketed NSAID (non-steroidal anti-inflammatory) and given a piece of paper with 12 “patellofemoral exercises” on it. You’re not sure what just happened in this confusing 15 minute turn-of-events, but you seem to remember some kind of vague instructions to “stop if you have pain.” Were you one of the rare people who actually did the 12 exercises and got the gift of worsened pain for your efforts? Well, as you know if you are someone who frequents this blog, there is Good News! Exercises are not benign, but specific. “If nothing happens in 1-2 weeks, come back in.” I’m glad my time and money are worth that much to you!! Believe it or not, this crazy scenario happens every day when it comes to exercises for knee pain! Just like a pharmaceutics, exercise requires a trained individual to prescribe it to you. There is a specific one for you and the dose, like your medicine, needs to be “therapeutic.” This means the type of medication was designed for your specific symptom and the dose was prescribed at a certain frequency. Exercise for also requires a “therapeutic dose (a specific direction, speed, frequency and/or position)” in order for it to be effective. In fact, a research group headed by Richard Rosedale, PT, Dip.MDT demonstrated that if you perform your exercise prescription at the dose and frequency prescribed by your advanced trained MDT practitioner for your knee pain, you will have far superior and quicker results than what current “evidence-based” medicine suggests or placebo (J Orth Sports Phys Ther 2014)!. Exercises for knee pain should not be randomly given.. I would not recommend a search for “knee pain exercises” nor the off-chance of anyone performing 12 random exercises for their knee pain.